A flawless technical performance today confirmed Britain’s Joanne Eccles as firm favourite to take Female individual gold in Vaulting at the Alltech FEI World Equestrian Games 2014 in Caen, France on Friday. The defending world champion showed all the grace, flair and confidence that has given her super-star status in the sport. And her adoring fans went wild with delight when she posted the winning score of 8.513 on Thursday night. “I feel so good in this arena!” she said. “I even treated myself to an extra few seconds at the end to savour the crowd’s applause and look out onto all the British flags in the stands and see all these people who follow Vaulting and Team GBR in particular,” she added. Eccles reckoned that this was a personal best result in the Technical test which encompasses five moves performed in any order. Italy’s Anna Cavallaro finished second on an average score of 8.240 and the USA’s Mary McCormick finished third on 7.989. French vaulter Anne-Sophie Musset was disappointed when slotting into seventh place. She said she had a last-minute issue which broke her concentration, so she was less focused than she needed to be. “Several figures didn’t go as well as they normally do in competition such as the front roll and the needle,” she said. In the Men’s Technical competition there was a surprise when Germany’s Erik Oese pinned French vaulters Nicolas Andreani and Jacques Ferrari into second and third. Ferrari, who has been showing top form all week, still heads the provisional rankings but this defeat was something of a shock. He predicted a recovery by the two French stars, Andreani and Jacques, before the medals are handed out on Friday night. Runner-up Andreani was emotional because it was his last time to perform his Marcel Marceau mime routine. “The French mime deserved a stage like the Zenith to go out on,” he said. And he was delighted with the performance of his horse, Just a Kiss HN. “I am so pleased every time Just takes to the arena. Being his third WEG, I think it will be his last,” Andreani said. Erik Oese stole the limelight with a spectacular performance, but the crowd also reacted warmly to the result achieved by 17-year-old Lambert Leclezio who has been showing remarkable improvement all week. The vaulter from Mauritius really stole the hearts of the audience who gave him a standing ovation today. In contrast there was no real surprise when Austria’s Jasmin Lindner and Lukas Wacher topped the first round of the Pas de Deux. 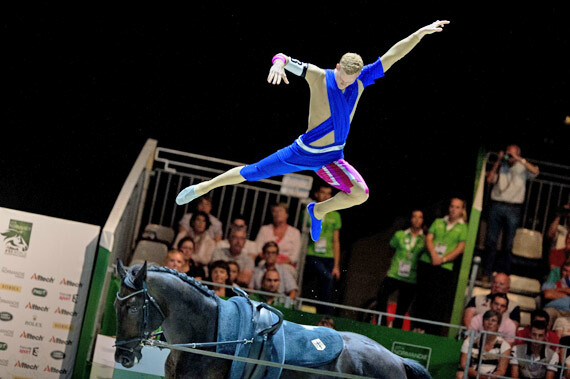 The polished pair clinched the 2012 FEI World Vaulting Championship title in Le Mans (FRA) before storming to victory at the FEI European Vaulting Championships 2013 in Ebreichsdorf (AUT), and they lived up to their billing as the hottest tickets in town when posting 9.083 for the win. Germany’s Gera Marie Grun and Justin Van Gerven slotted into second on a score 8.631 while Joanne Eccles joined her sister, Hannah, to finish third on 8.570. This the first time for Pas de Deux to be included in the Games vaulting schedule, and there is great anticipation ahead of the second round which, following the award of the Squad and Male and Female Individual medals on Friday, will bring the Vaulting championships to a close. Female Technical: 1, Joanne Eccles GBR 8.513; 2, Anna Cavallaro ITA 8.240; 3, Mary McCormick USA 7.989; 4, Simone Jaiser SUI 7.988; 5, Rikke Laumann DEN 7.802; 6, Kristina Boe GER 7.546; 7, Anne-Sophie Musset FRA 7.474; 8, Elizabeth Ioannou USA 7.457; 9, Hannah Eccles GBR 7.449; 10, Corinna Knauf GER 7.305. Male Technical: 1, Erik Oese GER 8.400; 2, Nicolas Andreani FRA 8.228; 3, Jacques Ferrari FRA 8.101; 4, Lambert Leclezio MRI 7.937; 5, Thomas Brusewitz GER 7.815; 6, Vincent Haennel FRA 7.745; 7, Lukas Heppler SUI 7.484; 8, Viktor Brusewitz 7.419; 9, Adam Lukac SVK 7.411; 10, Stefan Csandl AUT 7.170. Pas de Deux, Round 1: 1, Jasmin Lindner/Lukas Wacha AUT 9.083; 2, Gera Marie Grun/Justin Van Gerven GER 8.631; 3, Joanne Eccles/Hannah Eccles GBR 8.570; 4, Evelyn Freund/Stefanie Millinger AUT 8.530; 5, Pia Engelberty/Torben Jacobs GER 8.516; 6, Cassidy Palmer/Kimberly Palmer USA 8.149; 7, Mary Garrett/Kristian Roberts USA 7.729; 8, Brooke Boyd/Todd Griffiths CAN 7.715; 9, Carola Sneekes/Esther Sneekes NED 7.527; 10, Angelique Van der Sluus/Jeanine van der Sluus 6.949; 11, Blanka Nemeth/Kornelia Acs HUN 6.267; 12, Reka Gadolla/Agnes Kiraly HUN 5.158.